Our programs exist because of the generosity of many donors and sponsors. We can help you make AAFA New England a part of your milestone or celebration. We will be happy to work with you to design an appropriate project for any age – from nursery school to bar/bat mitzvah or confirmation to retirement. We will be happy to provide you with handouts or donation forms. Join our e-mail list to receive updates on the latest news and events. 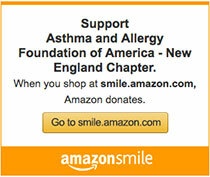 © 2019 Asthma and Allergy Foundation of America New England Chapter. All Rights Reserved.